We’d love your help. Let us know what’s wrong with this preview of Hellhound by Lou Yardley. Kit pops into the pub following a dismal experience at a job interview. Christine visits the same pub whilst waiting for a cab. Both of their lives will be cha The Hound & The Philosopher Inn looks like your average pub, with only its mouthful of a name to separate it from any other. But, secrets lurk just beyond the ales, wines, spirits and bar snacks. Deadly secrets. To ask other readers questions about Hellhound, please sign up. There's plenty of gore in this fast-paced action thriller, but it never quite crossed the line to where I was uncomfortable - it went close a couple of times, but the grue was well controlled. Top marks for relatable characters - even the bad guys - and for a really original take on the popular werewolf trope. Nowadays it is practically de rigeur to make the monster a hero, so I found it refreshing to see werewolves portrayed in the traditional way - as a scourge, a plague, and most definitely e There's plenty of gore in this fast-paced action thriller, but it never quite crossed the line to where I was uncomfortable - it went close a couple of times, but the grue was well controlled. Nowadays it is practically de rigeur to make the monster a hero, so I found it refreshing to see werewolves portrayed in the traditional way - as a scourge, a plague, and most definitely evil. All around a good read. A well thought out werewolf story that takes you from the present to the history of their past and back again. An imaginative and different spin on the creation and demise of werewolves weaved into a semi-fast paced plot full of discovery, deceit, and power. It will give those down on their luck something to reconsider when entering an unfamiliar pub to drink away their sorrows. I loved this fast passed werewolf story. It’s gory, entertaining, and the characters are fully fleshed out. I thoroughly enjoyed this werewolf story, which had a good pace, lots of gory detail and interesting characters. I couldn't put it down, and hope there's more to follow! 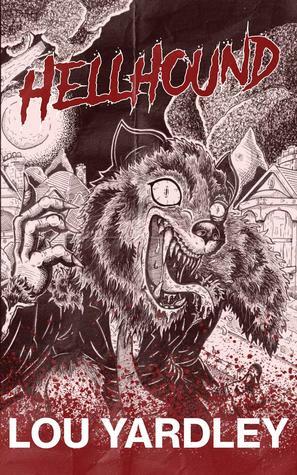 Hellhound is a fantastic werewolf story, with interesting and believable characters. It is written well, and fast paced, with just the right levels of mystery and gore. Highly recommended. I'm a big horror fan but not usually werewolf stories. However 'Hellhound' is a must read, utterly captivating and gives a unique and quirky twist on this ancient horror trope. Hellhound, by Lou Yardley, is not like your usual werewolf tale. There's a a sort of chaotic organization that reminded me of the Underworld movie series. Except this book carried a theme that made you remember monsters aren't restricted to the night time. Hellhound carried a backstory that brought you into the current situation, providing all the information you needed to know! This story isn't about one person and their trials to the end. It's about a huge conspiracy amongst the werewolves. You Hellhound, by Lou Yardley, is not like your usual werewolf tale. There's a a sort of chaotic organization that reminded me of the Underworld movie series. Except this book carried a theme that made you remember monsters aren't restricted to the night time. Hellhound carried a backstory that brought you into the current situation, providing all the information you needed to know! This story isn't about one person and their trials to the end. It's about a huge conspiracy amongst the werewolves. You think it's about a young man, down on his luck, looking for a job. You think it's about a girl who sees something shady activity in a pub trying to be a Good Samaritan. NO. You may also think it's about a collective, called The Six, doing their best to keep a tight reign on a group of wildlings out to create names for themselves... No. You could assume a great deal with Hellhounds. I won't say what it's truly about, but I can tell you that it's a fun ride and right before you get to the huge fight at the end, you understand that there's more to come! The story is great and I'm a fan of the author. The story went in the right direction, by going in all sorts of directions- but that's what kept me. The story is rich and original in the origin of things too! I'd never have imagined the true beginning of werewolves were from ***NO SPOILERS***. Sorry folks; you'll have to read the book. Just know that it's pretty cool. Lou Yardley is an Office Gremlin by day and an author specialising in horror, weirdness and dark fantasy by night (the dark fantasy stuff will be coming soon!). She published her debut novel, a delightful little yarn about spiders and demons called "The Other's Voice" in 2016, and she hasn't really stopped since. As well as training her army of seven cats, Lou is currently working on a stand-alone Lou Yardley is an Office Gremlin by day and an author specialising in horror, weirdness and dark fantasy by night (the dark fantasy stuff will be coming soon!). As well as training her army of seven cats, Lou is currently working on a stand-alone novel called "Hellhound".